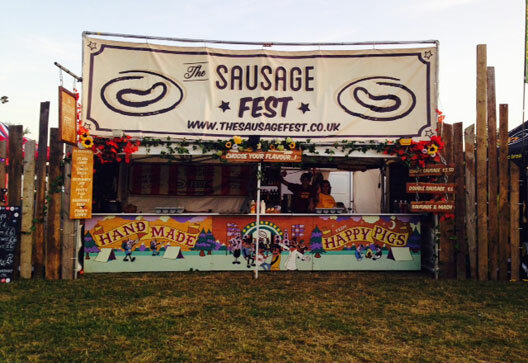 The Sausage Fest has been our family business since 2012 and has grown year on year giving us the chance to appear at some of the UK's most awesome festivals, though there are still plenty out there we have yet to bring sausage to! We are based in Bristol and are proud to have all our sausages supplied to us by The Sausage Shed with some of our flavours winning awards as well as just being darn mouth wateringly tasty. Have a look at www.thesausageshed.co.uk and you'll see what we mean! There's nothing we like more than packing up our team and rolling over to a likely field to serve our sausages to the people of the festival world – be you young, old or somewhere in the middle, come one, come all and sample The Sausage Fest!